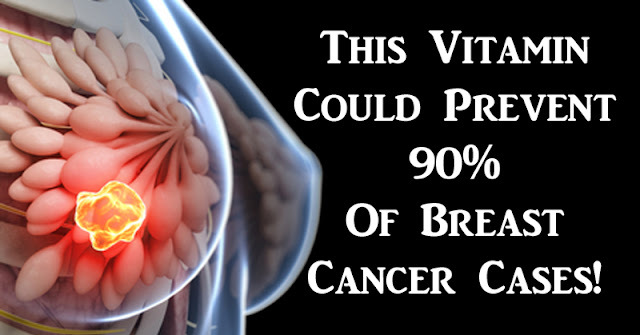 Health This Vitamin Could Prevent 90% Of Breast Cancer Cases! This Vitamin Could Prevent 90% Of Breast Cancer Cases! It's estimated that about one in eight American women will develop invasive breast cancer over the course of her lifetime. For women in the United States, breast cancer death rates are among the highest cancer death rates, second only to lung cancer. A breast cancer diagnosis can be completely debilitating to women, family and friends. Research is constantly being conducted on cancer prevention and cure, and new studies show that a certain vitamin may be the key to preventing a large number of breast cancer diagnoses. Vitamin D has previously been studied for its benefits in preventing several diseases, including heart disease, diabetes and depression. Researchers are now testing theories that it may be able to help prevent breast cancer. The link between Vitamin D deficiency and cancer was tested and confirmed in over 200 epidemiological studies. One such study was conducted by Joan Lappe and Robert Heaney. In the study, a group of menopausal women were given Vitamin D in order to raise their serum levels to 40 ng/ml. Researchers found that after four years, these women experienced a 77% reduction in the occurrence of all cancers. Several risk factors for developing breast cancer are known. With a few lifestyle changes, you may be able to lower your risk. Smoking, drinking and diet are just a few of the factors that are believed to affect a cancer diagnosis. But this new research may take breast cancer prevention to a new level. Dr. Cedric F. Garland from the University of California’s San Diego Moores Cancer Center has been an integral part of this research. He explains that in almost all forms of breast cancer, Vitamin D affects the structure of the epithelial cells. These specific cells are held together by a substance known as E-cadherin, which is mainly comprised of Vitamin D and calcium. Without enough Vitamin D, the structure collapses and the cells multiply, leading to cancer in many cases. If someone has already been diagnosed with breast cancer, adding a sufficient amount of Vitamin D to the diet may help stop cancer cells by replenishing the E-cadherin in the body. Carole Baggerly, the founder of GrassrootsHealth.com, is aiming to spread the word about the crucial role that Vitamin D can play in many aspects of our health. Baggerly believes that optimizing Vitamin D levels may help prevent more than 16 different types of cancer, including pancreatic, lung, ovarian, breast, prostate and skin cancers. When it comes to breast cancer, she says that 90% of ordinary breast cancer is related to Vitamin D deficiency. Of the 30,000 genes in the body, Vitamin D affects almost every single one of them. So how much Vitamin D are we talking about? The first step is to get your levels measured in order to find the right amount for you. In general, about 20 minutes of sun exposure each day is recommended, between the hours of 10am and 2pm. If you’re taking a Vitamin D supplement, the window is thought to be 50-70 ng/ml, or about 8,000 IU’s per day. Check here for a more specific chart that shows disease prevention by serum Vitamin D level.